The Boston Red Sox may have struggled at home against the Baltimore Orioles this past week with a three-game sweep against the A.L. East-leading squad, but the offense improved to win three out of four at Kansas City to improve to 66-84 with only two weeks remaining. The Red Sox still have a lot to decide on over the last couple of weeks, so still tune in for the different story lines — especially for the third base and starting pitcher situations. According to reports, Rusney Castillo will be up with the big league club on Tuesday when the team arrives in Pittsburgh for a three-game set against the Pirates. 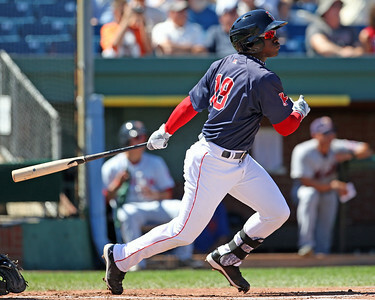 Castillo hit .278 with the Pawtucket Red Sox in the Governor’s Cup while knocking a couple doubles in the fifth and deciding game on Saturday. Heath Hembree, Eduardo Escobar, Ryan Lavarnway and Bryce Brentz will all also be called up to show what they can provide at the major league level going forward into the offseason and 2015. The Red Sox may be out of the playoff hunt, but they still have a role in deciding what teams are going to make it into the postseason. After winning three of the four games on the road against the Royals, the Red Sox have won six of seven against the team now leading the second Wild Card spot by one game after going into the series leading the A.L. Central by a game. Sure, there are only 12 games left for the Red Sox, but six of these are against teams still vying for the playoffs. If the team can play spoiler over these last two weeks, then it might be fun to watch this team as the season winds down. The Red Sox have six road games this week and have a chance to win at least half these games if the pitching can keep the opponents off the scoreboard. Prediction: 3-3; the Red Sox have played well on the road this season and could win a series against a playoff-bound Pirates club. Winning a series at Baltimore has been tough to come and that is where the Red Sox will struggle this week.